Sacred fig (Ficus religiosa) is a species of banyan fig, characterized by great age and large size (up to 30 meters (98 feet) in height and a trunk diameter of up to three meters (9.8 feet)) and considered sacred by followers of Hinduism, Jainism, and Buddhism. Besides sacred fig, other common names include bo, Bodhi, peepul (or pipal), and the ashvastha tree. Two famous representatives of sacred fig are the Bodhi tree and the Sri Maha Bodhi tree propagated from it. Siddhartha Gautama, the spiritual teacher and founder of Buddhism who later became known as Gautama Buddha, is said to have been sitting underneath a sacred fig, known as the Bodhi tree, when he was enlightened (Bodhi), or "awakened" (Buddha). The known planting date of the Sri Maha Bodhi, 288 B.C.E., in Sri Lanka, gives it the oldest verified age for any angiosperm (flowering plant). The sacred fig, or bo tree, is a well-known symbol for happiness, prosperity, longevity, and good luck. 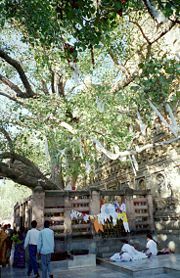 Today in India, Hindu Sadhus still meditate below this tree, and in Theravada Buddhist Southeast Asia, the tree's massive trunk is often the site of Buddhist and animist shrines. Typical shape of the leaf of the Ficus religiosa. Ficus religiosa is a type of fig; that is, a member of the genus Ficus of the mulberry family, Moraceae. In addition to the sacred fig, other well known figs include the common fig, Ficus carica, which produces a commercially important multiple fruit, and Ficus benghalensis, the Indian Fig Tree, which is the National tree of India. The Ficus genus is characterized by hundreds of tiny flowers occurring inside a fleshy, fruit-like body (a syconium). The fruit-like body or receptacle is commonly thought of as a fruit, but it is properly a false fruit or multiple fruit, in which the flowers and seeds grow together to form a single mass. Technically, a fig fruit would be one of the many mature, seed-bearing flowers found inside one receptacle. The syconium often has a bulbous shape with a small opening (the ostiole) at the apex that allows access by pollinators. The flowers are pollinated by very small wasps that crawl through the opening in search of a suitable place to reproduce (lay eggs), often leaving their wings and even antenna at the entrance as they push through the narrow slits (Galil and Snitzer-Pasternak 1970). These wasps are known as fig wasps. A direct clone descendant of the Bodhi tree, planted at Foster Botanical Garden in Honolulu, Hawaii. 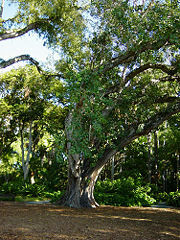 The sacred fig is a type of fig known as a banyan. While the term "banyan" is often used specifically for the species Ficus benghalensis, in the broader sense of the term used here a banyan is a type of fig that starts its life as an epiphyte when its seeds germinate in the cracks and crevices on a host tree (or on structures like buildings and bridges). Figs that share a similar unique life cycle are given the generalized term "banyans" and placed together in the subgenus Urostigma. The seeds of banyans are dispersed by fruit-eating birds. The seeds germinate and send down roots toward the ground, and may envelop part of the host tree or building structure with their roots, giving them the casual name of "strangler fig." Older banyan trees are characterized by their aerial prop roots, which grow into thick woody trunks that, with age, can become indistinguishable from the main trunk. Old trees can spread out laterally using these prop roots to cover a wide area. Ficus religiosa, the sacred fig, is a large dry season-deciduous or semi-evergreen tree. The leaves are cordate(heart shaped) with a distinctive extended tip; they are 10-17 centimeters (4-6.7 inches) long and 8-12 centimeters (3-4.7 inches) broad, with a 6-10 centimeter (2.4-4 inches) petiole. The fruit is a small fig 1-1.5 centimeters (.4-.6 inches) in diameter, green ripening purple. The trees are up to 30 meters (98 feet) tall and with a trunk diameter of up to three meters (9.8 feet). Typically, there is only one species of fig wasp capable of fertilizing the flowers of each species of fig. In the case of the sacred fig, the associated pollinator wasp is Blastophaga quadraticeps (Galil and Snitzer-Pasternak 1970). This species possesses two thoracic pockets that store pollen used in the pollination. The female wasps, after being impregnated, approach ripe anthers and load the pockets by swift movement of the forelegs and then depart their home syconium via narrow channels bored by the males. They then enter a receptive fig syconium, and empty the pockets during oviposition (Galil and Snitzer-Pasternak 1970). The sacred fig is native to Sri Lanka, Nepal, and India, southwest China, and Indochina east to Vietnam. The wide range of local names include bo or pou (from the Sinhalese bo), Bodhi (in Thai Language), pipal (peepal, peepul, pippala, pimpal, and so on), arali, or Ashvastha tree. The Bodhi Tree at the Mahabodhi Temple. Propagated from the Sri Maha Bodhi, which in turn is propagated from the original Bodhi Tree at this location. The Bodhi Tree, also known as the bo tree, was a large and very old sacred fig located in Bodh Gaya (about 100 kilometers or 62 miles from Patna in the Indian state of Bihar) under which Siddhartha Gautama (Gautama Buddha), the founder of Buddhism is said to have received enlightenment, or Bodhi, according to Buddhist tradition. In religious iconography, the Bodhi tree is easily recognizable from its heart-shaped leaves, which are usually prominently displayed. The term "Bodhi tree" is also widely applied to currently existing trees, particularly the sacred fig growing at the Mahabodhi Temple, which is probably a direct descendant of the original specimen. This tree is a frequent destination for pilgrims, being the most important of the four holy sites for Buddhists. 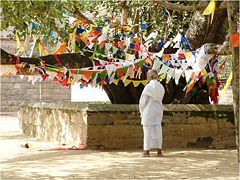 Other holy Bodhi trees which have a great significance in the history of Buddhism are the Anandabodhi tree in Sravasti and the Bodhi tree in Anuradhapura. 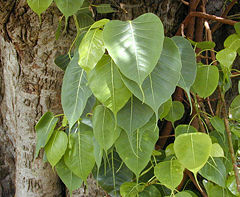 Both are believed to have been propagated from the original Bodhi tree. According to Buddhism, after his Enlightenment, the Buddha spent a whole week in front of the tree, standing with unblinking eyes, gazing at it with gratitude. The spot was used as a shrine even in the lifetime of the Buddha, the only shrine that could be so used. King Asoka was most diligent in paying homage to the Bodhi tree, and held a festival every year in its honor in the month of Kattika. Buddhist tradition recounts that while the Buddha was yet alive, in order that people might make their offerings in the name of the Buddha when he was away on pilgrimage, he sanctioned the planting of a seed from the Bodhi tree in Bodhgaya in front of the gateway of Jetavana Monastery near Sravasti. Sri Maha Bodhi, Anuradhapura. Sri Lanka. 2006. Sanghamitta landing with the Bodhi tree sapling at Sri Lanka. Sri Maha Bodhi is a sacred fig tree in Anuradhapura, Sri Lanka, which is said to be a sapling from the historical Bodhi tree under which Buddha became enlightened. It is one of the most sacred relics of the Buddhists in Sri Lanka and respected by Buddhists all over the world. According to the Ceylon Chronicles, the Sri Maha Boda was planted in 288 B.C.E., making it the oldest living human-planted tree in the world with a known planting date. According to Buddhist tradition, in that year (the twelfth year of King Asoka's reign), the right (or southern) branch of the Bodhi tree was brought by Sanghamittā to Anurādhapura and placed by Devānāmpiyatissa in the Mahāmeghavana. The Buddha, on his death bed, had resolved five things, one being that the branch which should be taken to Ceylon should detach itself. 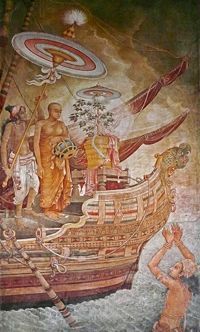 From Gayā, the branch was taken to Pātaliputta, thence to Tāmalittī, where it was placed in a ship and taken to Jambukola, across the sea; finally, it arrived at Anuradhapura, staying on the way at Tivakka. Those who assisted the king at the ceremony of the planting of the Tree were the nobles of Kājaragāma and of Candanagāma and of Tivakka. It was planted on a high terrace about 6.5 meters (21.3 feet) above the ground and surrounded by railings. This wall was constructed during the reign of King Kirthi Sri Rajasingha, to protect it from wild elephants, which might have damaged the tree. Athreya, V. r. 1997. Trees with a difference: The strangler figs. Resonance July 1997. Retrieved May 20, 2008. Galil, J., and Y. Snitzer-Pasternak. 1970. Pollination in Ficus religiosa L. as connected with the structure and mode of action of the pollen pockets of Blastophaga quadraticeps Mayr. New Phytologist 69(3): 775 - 784. Retrieved May 20, 2008. Natural History Guide To American Samoa. n.d. Banyan trees. University of Washington. Retrieved May 20, 2008. This page was last modified on 15 September 2008, at 13:45.